Product #12446 | SKU MCIRP40DHG | 0.0 (no ratings yet) Thanks for your rating! Marumi DHG Circular Polarizing filters are designed for the least reflection and higher contrast. These filters have been specially designed with digital photography in mind. Each filter uses a specially developed ultra-low reflection coating to minimize internal reflection off the cameras built-in CCD and CMOS Sensors. 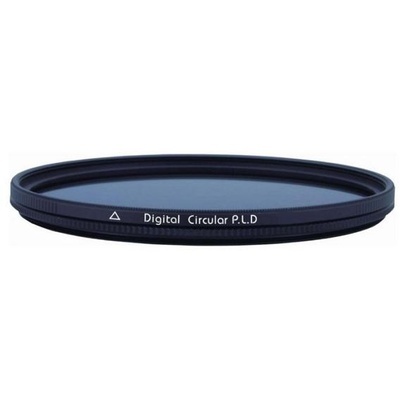 The ideal circular polarizing filter for digital cameras, featuring DHG Coating. The DHG Circular PL (D) maximizes the lens' performance and represents contrasty pictures. Suitable also for wide-angle lenses. Front lens cap can be attached. Saturates the image more by eliminating unwanted reflections. Light rays which are reflected become polarized. Polarizing filters are used to select which light rays enter your camera lens. They can remove unwanted reflections from non-metallic surfaces such as water or glass and also saturate colors providing better contrast. The effect can be seen through the viewfinder and changed by rotating the filter. The filter factor varies according to how the filter is rotated and its orientation to the sun. This filter eliminates ultraviolet rays to remove haze from outdoor shots as well as polarizing the light to remove reflections, and increase color saturation, without affecting the overall color balance.